I have been tweeting web comics for each story in Savage Fire , my recently published short story collection, to give readers ideas about the stories, as well as a puzzle to solve. I call them web comics, but the structure is a limerick loosely about the story written on top of an image that has some relationship with the story. If you own a copy of the book (and if you don't, hurry over and buy a copy on Amazon or at Smashwords for only $2.99), you can read the story and figure out what twisted logic I have employed to get to that image and that limericks. If you don't get enough from that one story, don't worry, there are sixteen in all. 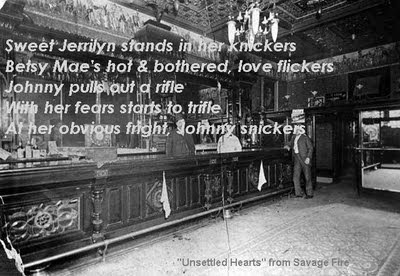 The seventh story in the Savage Fire book, "Unsettled Hearts", is Old Western/action/lesbian story. Seriously. Not kidding. Read it and you'll see.